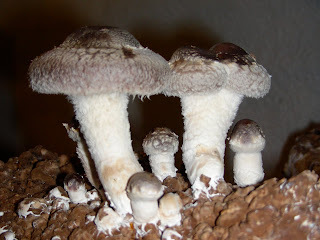 These are the first flush of a new shiitake crop. We grow on enriched hardwood sawdust blocks, with our first pick coming approximately 5 months after innoculation. The blocks will fruit for 1 1/2 to 2 months, with cleaning and soaking in between flushes. Saute the leeks for about 5 minutes in the olive oil, stir in mushrooms and salt, and cook for about 10 more minutes over medium heat, stirring occasionally. Add shrimp, and cook til just done, then add spinach leaves and cook until wilted, stirring every few minutes. Meanwhile, bring a large potful of water to boil, and cook pasta until just tender. Drain, transfer to serving bowl and drizzle with a bit of olive oil. Immediately sprinkle with cheese and stir well. Pour sauce over pasta, mix well from the bottom. Top with fresh ground black pepper and enjoy!